My high school history teacher once imitated shooting the entire class with a machine gun to demonstrate what Americans were like. As the only Canadian-born member of my entirely American family, this dramatic display stung a little bit, but it was nothing new. I’ve grown up surrounded by people who openly make fun of Americans — and with vigour. I’ve heard it from teachers, classmates, strangers in coffee shops and even close friends. 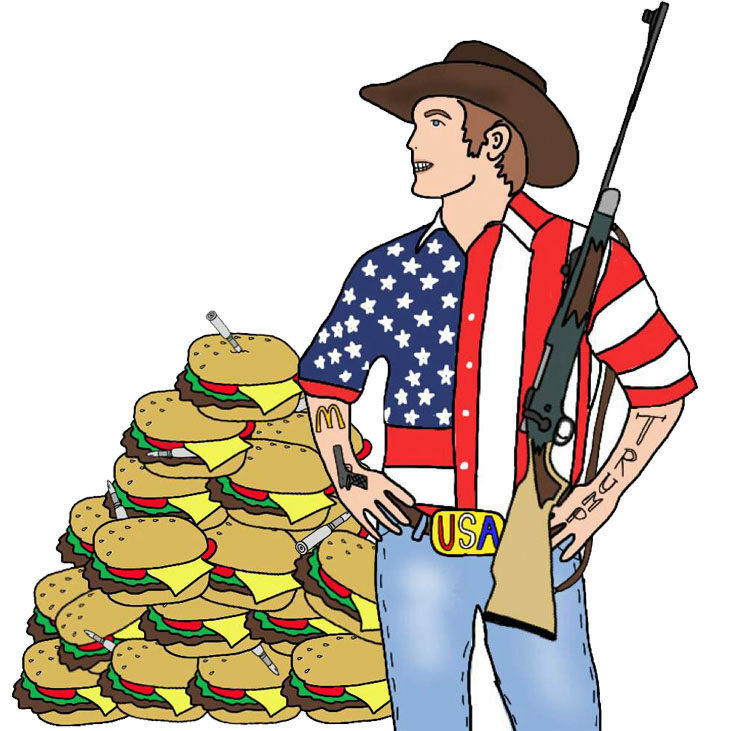 Some of the things they say about Americans: that they think all Canadians live in igloos, that they’re all obese, and that they’ll shoot anything that moves. These “comedic” stereotypes don’t represent the America I personally know. My father was born in Maryland and my mother in New Jersey. They met while living in Detroit, Mich., and married shortly after. My older sister was born in Massachusetts while my father was working as the president of Montserrat College of Art. When he got the job as president of Alberta College of Art and Design, the three of them hightailed it to Calgary on an emergency visa. I was born a few weeks after the move, earning dual citizenship at birth. They applied for landed immigrant status later that year and achieved full citizenship many years later after we moved to Ontario. I took the photo of my parents and sister at the citizenship ceremony. My American family led me to pronouncing words like “forest” and “orange” as “far-est” and “ahr-ange” until I taught myself to stop after much ridicule from elementary classmates. Kids can be cruel. But it wasn’t just kids. I’ve sat in many classrooms where the teacher instigated the “Canadians are better than Americans” conversation. In high school, my teacher wheeled in the television to play a VHS tape of Rick Mercer’s comedic segment Talking to Americans. The class erupted in laughter as Mercer interviewed American pedestrians about Canadian politics or satirical Canadian news. Of course the segment showcases Americans as completely clueless to everything Canadian. If I had asked any laughing kid in that room a detailed question about American politics or history, I doubt they would’ve looked much better. We simply consume far more from America than they do of us. We receive so much of their news, media, and music, largely because they produce a lot more than we do. Not to say that they don’t consume anything of ours — after all, we did bless them with Justin Bieber. But they mostly survive off their own content. Let’s not forget that the population of the state of California alone is greater than all of Canada by a few million people. We know more about them than they do about us because we’re quite small in comparison. Canada prides itself in celebrating diversity. We’re taught to respect all ethnicities and take pride in our multicultural society. However, the culture gap between Canadians and Americans is small enough that no one cringes or questions the correctness of someone making fun of Americans. My Grade 9 geography textbook referenced the multiculturalism of Canada as a “mosaic,” while America was referred to as a “melting pot.” My teacher explained that Americans wanted all people who were not of the typical, Caucasian, American culture to assimilate to their values and norms. Meanwhile, we were told that Canada respected each culture as its own entity, celebrating the individualism and history of foreign cultures. The basis of the lesson was that Americans didn’t value multiculturalism — they wanted everyone to be just like them. In saying this, they naturally forgot to mention the snippets of Canadian history we so often like to hide. Canada certainly doesn’t have a clean slate when you consider the dark history of Japanese internment camps during the Second World War or the residential school system that devastated many of Canada’s indigenous people. Instead, my teachers focused on the downfalls of the United States. As far as I know, Canada has not magically escaped having racist citizens. Neither country is perfect. They had no idea they were hurting me, a kid in their class, while they openly generalized my entire family as a stereotype. With Donald Trump currently dominating American media, I’ve started to hear the stereotypes swirling around me once again. I’d like to send out a reminder that not all of America can be generalized by Trump’s actions and the beliefs of his supporters. There’s certainly a lot of work to do in America. Many minds need to be changed and many hands hold power that definitely shouldn’t, but I think the same can be said for any country. We can’t view all of America as a gun-touting, misinformed slew of nutcases because of the actions of certain groups of people. I haven’t escaped the generalizations in university, either. Just last year, my English professor initiated a book discussion that ended in a classroom-wide roast of American culture. After a third-year student explained that Americans are generally unintelligent, another student bravely raised her hand and admitted that she was in fact American. The class was silent and many of those who had expressed their opinions were immediately embarrassed and quick to apologize. Sitting through conversations like these will never begin to compare to what I imagine a racialized student has endured. However, it remains a good example of how Canadians aren’t always the kind, accepting bunch we claim to be. But I’ve learned to take it all with a sense of humour. I’ve grown up with my grandparents, aunts, uncles, three brothers, nieces, nephews and cousins spread over multiple states. The worst thing I’ve ever heard them say about Canada is their expressed confusion that Ontario’s milk comes in bags. Let’s stick to our own stereotype of politeness and inclusiveness. If we want to call ourselves a mosaic, we have to respect each tile. This article was published in the print edition of The Ryersonian on Feb. 10, 2016.